The follicles may contain a central lumen filled with colloid. Colloid-filled follicles appear more frequently with increasing age an can be overall distributed in the pars distalis of the adenohypophysis. They are small and regularly shaped. There is contradiction in literature whether the follicular epithelium consists of ciliated non-granular stellate cells only or that also secretory cell types are involved. The exact role of the stellate cells is yet unknown. Besides colloid-filled follicles, cysts filled with a fibrous material can occur. 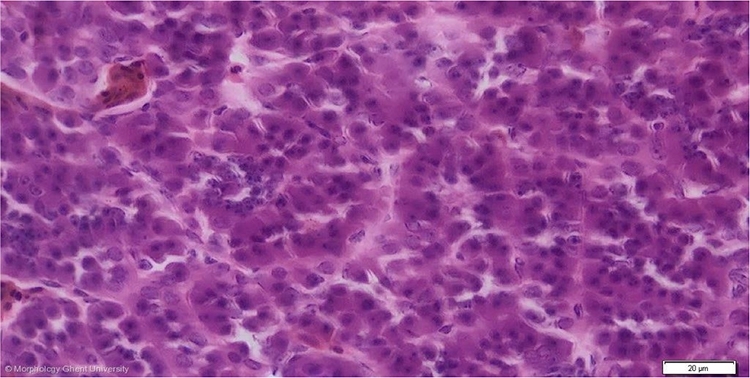 These cysts are bigger, irregular structures, located at the ventral margin of the pars distalis of the adenohypophysis only and are exclusively observed in adult birds.